Alnwick Castle is a castle and stately home in the town of Alnwick in the English county of Northumberland. It is the seat of the Duke of Northumberland, built following the Norman conquest, and renovated and remodelled a number of times. It is a Grade I listed building and as of 2012 received over 800,000 visitors per year. The current duke and his family live in the castle, but occupy only a part of it. The castle is open to the public throughout the summer. After Windsor Castle, it is the second largest inhabited castle in England. Alnwick was the tenth most-visited stately home in England according to the Historic Houses Association, with 195,504 visitors in 2006. Special exhibitions are housed in three of the castle’s perimeter towers. The Postern Tower, as well as featuring an exhibition on the Dukes of Northumberland and their interest in archaeology, includes frescoes from Pompeii, relics from Ancient Egypt and Romano-British objects. Constable’s Tower houses military displays like the Percy Tenantry Volunteers exhibition, local volunteer soldiers raised to repel Napoleon’s planned invasion in the period 1798–1814. The Abbot’s Tower houses the Regimental Museum of the Royal Northumberland Fusiliers. The castle is used as a stand-in for the exterior and interior of Hogwarts in the Harry Potter films, which has led to an increase in public interest. Its appearance in the films has helped shape the public imagination regarding what castles should look like. Its condition contrasts with the vast majority of castles in the country, which are ruinous and unfit for habitation. The wide angle images are computer generated. It has previously been a location used in Becket, The Black Adder, Robin Hood: Prince of Thieves and many others. The castle grounds are also regularly in use as a cross country running venue as part of the North East Harrier League. Alnwick Castle guards a road crossing the River Aln. Yves de Vescy, Baron of Alnwick, erected the first parts of the castle in about 1096. The castle was first mentioned in 1136 when it was captured by King David I of Scotland. At this point it was described as “very strong”. It was besieged in 1172 and again in 1174 by William the Lion, King of Scotland and William was captured outside the walls during the Battle of Alnwick. Eustace de Vesci, lord of Alnwick, was accused of plotting with Robert Fitzwalter against King John in 1212. In response, John ordered the demolition of Alnwick Castle and Baynard’s Castle (the latter was Fitzwalter’s stronghold); however, his instructions were not carried out at Alnwick. When the Vescy family became extinct, Alnwick Castle and the surrounding manor were bequeathed to Antony Bek the Bishop of Durham. The Percy family benefited from England’s wars with Scotland; through his military accomplishments Henry Percy, 1st Baron Percy (1273–1314), enhanced his family’s status in northern England. In 1309 he purchased the barony of Alnwick from Bek, and it has been owned by the Percy family, the Earls and later Dukes of Northumberlandsince. The stone castle Henry Percy bought was a modest affair, but he immediately began rebuilding. Though he did not live to see its completion, the building programme turned Alnwick into a major fortress along the Anglo-Scottish border. His son, also called Henry (1299–1352), continued the building. The Abbot’s Tower, the Middle Gateway and the Constable’s Tower survive from this period. 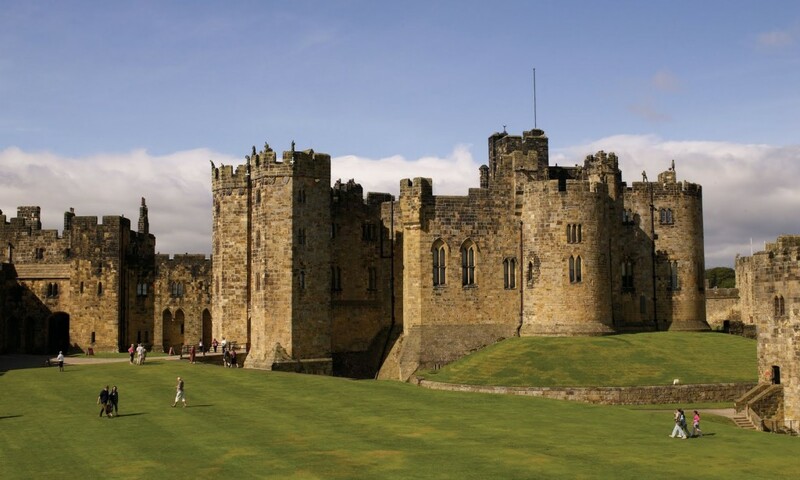 The work at Alnwick Castle balanced military requirements with the family’s residential needs. It set the template for castle renovations in the 14th century in northern England; several palace-fortresses, considered “extensive, opulent [and] theatrical” date from this period in the region, such as the castles of Bamburgh and Raby. In 1345 the Percys acquired Warkworth Castle, also in Northumberland. Though Alnwick was considered more prestigious, Warkworth became the family’s preferred residence. During the Wars of the Roses, castles were infrequently engaged in battle and conflict was generally based around combat in the field. Alnwick was one of three castles held by Lancastrian forces in 1461 and 1462, and it was there that the “only practical defence of a private castle” was made according to military historian D. J. Cathcart King. It was held against King Edward until its surrender in mid-September 1461 after the Battle of Towton. Re-captured by Sir William Tailboys, during the winter it was surrendered by him to Hastings, Sir John Howard and Sir Ralph Grey of Heton in late July 1462. Grey was appointed captain but surrendered after a sharp siege in the early autumn. King Edward responded with vigour and when the Earl of Warwick arrived in November Queen Margaret and her French advisor, Pierre de Brézé were forced to sail to Scotland for help. They organised a mainly Scots relief force which, under George Douglas, 4th Earl of Angus and de Brézé, set out on 22 November. Warwick’s army, commanded by the experienced Earl of Kent and the recently pardoned Lord Scales, prevented news getting through to the starving garrisons. As a result the nearby Bamburgh and Dunstanburgh castles soon agreed terms and surrendered. But Hungerford and Whittingham held Alnwick until Warwick was forced to withdraw when de Breze and Angus arrived on 5 January 1463. After Montagu’s triumphs at Hedgeley Moor and Hexham in 1464 Warwick arrived before Alnwick on 23 June and received its surrender next day. However in the 19th century Algernon, 4th Duke of Northumberland replaced much of Adam’s architecture. Instead he paid Anthony Salvin £250,000 between 1854 and 1865 to remove the Gothic additions and other architectural work. Salvin is mostly responsible for the kitchen, the Prudhoe Tower, the palatial accommodation, and the layout of the inner ward.According to the official website a large amount of Adam’s work survives, but little or none of it remains in the principal rooms shown to the public, which were redecorated in an opulent Italianate style in the Victorian era by Luigi Canina.